Sunday’s For Teachers: Expose You Students to Cool Experiences! This past Friday I was excited to bring Mr. Zach Lehner to my school. 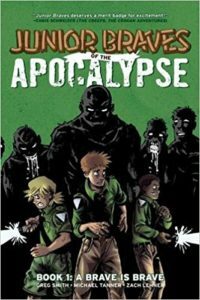 Zach is the fantastic artist of the Oni Press series Junior Braves of the Zombie Apocalypse, and he is an overall cool guy. I’ll be featuring an interview with Zach on a Friday very soon! As you may know, one of the coolest things about my hustle at cons and with industry folk, is that I make friends and connections that allow me to offer my students cool experiences. 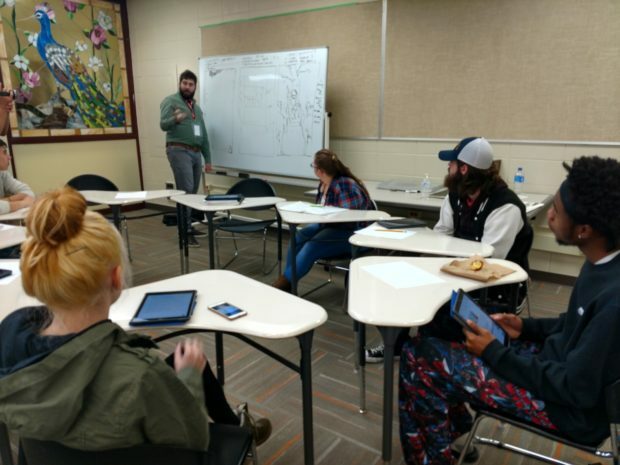 On Friday, Zach came up to Shepard High, and he spoke to English and Art classes during all lunch periods, and then he workshopped scripts with my graphic novel class AND worked on some cool storytelling with my 8th period. Below is Zach showing his book with a cover of vol. 1, which I reviewed during my 365, and you can read the review here. 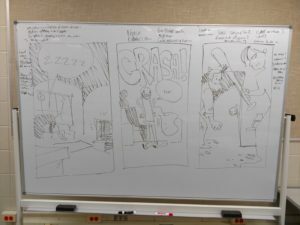 Here is Zach heading to the white board, helping one of my graphic novel students conceptualize their comic script. Eight students wanted to sit with Zach and workshop, so they did it as a group to also help each other! And here are two quick stories that Zach helped large groups of kids develop in the span of 30 minutes. 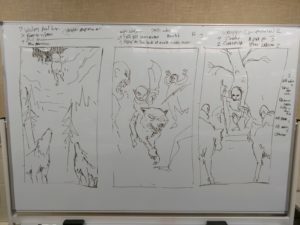 The first is about a vampire baby coming down to Earth to lead a wolf/zombie army, and the second is about a couple of folks breaking into a home and scaring the resident. Yes, that is me in the last panel of the second strip. The students loved it! 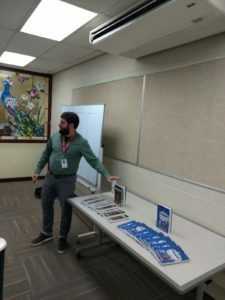 The individual students that Zach worked with in my graphic novel class came away from the experience inspired and in a much better place with their assignment, having workshopped their idea with an actual industry professional. It took a little bit of time to set up, but honestly, it wasn’t difficult. And yes, I know living in an area attached to the third largest city in the country helps, but let’s be honest…there are amazing professionals in every major city in this nation. You just need to reach out, and build those bridges. I hope you can use this as inspiration for your own cool school experience. Bring people in. Have them work with your kids. It’s often refreshing to hear a different voice.